The bears this trail is said to have been named for were grizzlies. They are now extinct in the southwest, but black bears can still be found in the area. People who come here say Bear Canyon retains more of a feeling of wildness than other canyons in the area. Perhaps that's because of its name, or maybe it's because this out-of-the-way place is a bit more remote and less visited than others in the Huachucas. Bear Canyon is an area of big trees, towering cliffs and abandoned mines. It is a steep canyon, and the normally dry streambed that runs through it is punctuated with precipitous plunges that become waterfalls during the spring snowmelt and after summer rains. The area surrounding Bear Canyon is the source of a number of legends; of lost gold mines, buried treasure and ghosts left over from battles with the Apaches. And there are other ghosts here as well. The remains of a wooly mammoth were discovered in this canyon fairly recently. Travelers on the Bear Canyon Trail may not find many mammoth remains, but they will run across evidence of old mining digs and miner's cabins. In a number of places, the trail follows what's left of the primitive roads these fortune-hunting pioneers carved into the mountainside. The Bear Canyon Trail climbs to an elevation of 8,060 feet at Bear Saddle, where it joins the Crest Trail #103. This major Wilderness trail provides access to the high ridges of the Huachucas and a number of connecting trails. From the saddle, the Bear Canyon Trail drops nearly 500 feet to Bear Spring where it joins the Ida Canyon Trail #110. 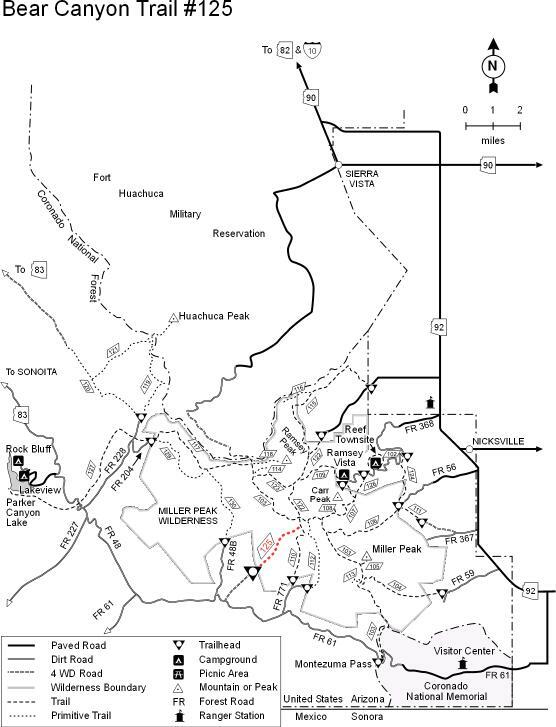 If you use a second car for a shuttle, you may complete a loop trip incorporating the Bear Canyon Trail by returning down the mountain via the Ida Canyon Trail or Oversite Canyon Trail #112. Drive south 13 miles out of Sierra Vista on Arizona Highway 92 to the Coronado Memorial Road (FR 61). Turn right (south) and continue through the Coronado National Memorial on FR 61. From Montezuma Pass, follow FR 61 west about 5.5 miles to a 4-wheel drive road that leads north into Bear Canyon. It's 1.6 miles on this road to the Wilderness boundary and trailhead. The trail is also accessible from the Ida Canyon Trail at Bear Spring.